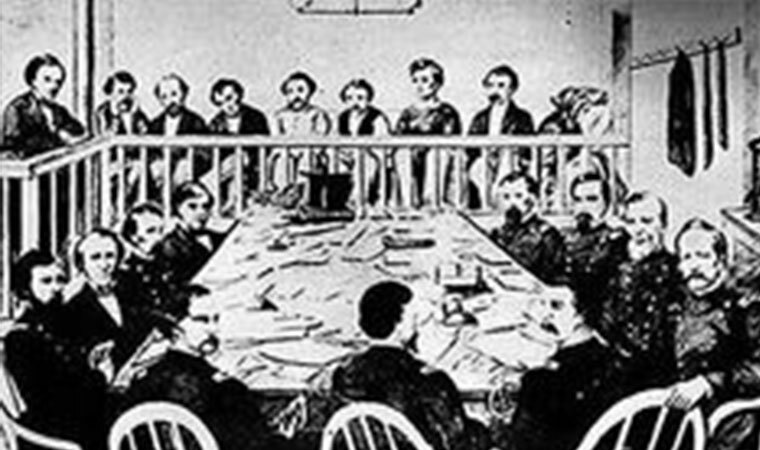 The commission in session hearing the case of the men and woman charged in killing President Abraham Lincoln. The proceeding was not a trial, very different rules apply. The United States still employs military commissions in terrorist cases involving foreign nationals. I read with great interest this morning a story about an unnamed ISIS suspect being detained without charges and now wanting a lawyer to represent his [presumably a he since that is the pronoun used in the article] interests. The truth is: The government’s argument is a refined 21st century version of the more blunt one used but unsaid more than 150 years ago. In short: “We got him. You want him. You come and get him. And remember we got the guns.” That was the effect of the War Department order to field commanders to send to Washington any habeas corpus court order sent their way to free a detainee. The department had no intention of complying with a civilian court in a time of war. The question of what to do with “suspicious characters” — male and female, young and old, citizens or not — in a time of war remains perplexing, troubling and likely unanswerable in broad sweeping categorization. I am certainly not saying the government [or we as a society] has no right to defend ourselves against would-be terrorists, treasonous citizens and those who strive to do us great harm. But how does a government or a society get to that point of being able to identify those persons, what they are plotting and what they are doing? How identifiable is that point where dangerous thought or talk is a matter for governmental action? And is “carrying out presumed lawful orders” no longer a defense? In fact, it were cases like this one following the terrorist attacks of 9/11 and the creation of this round of military commissions that drew me into taking a hard look at how all of this came about. For a new book on a Virginian holding a warrant in the Confederate Navy who seized a number of vessels on the Chesapeake Bay, burned a lighthouse and grabbed two steamers on Lake Erie, among other things, I have spent much of the last three years plowing through the Lincoln administration’s use of military commissions or more popularly called tribunals — not courts-martial — to handle political prisoners, spies, guerrillas, bushwhackers, arsonists, “pirates,” couriers, etc. These men and women were rounded up or captured by the Union Army and/or Navy on a battlefield , near an “incident,” on the water with lots of guns and or some other contraband in their possession, talked back to an officer in a “conflict zone” [a convenient 20th and 21st century circumlocution], were carrying hidden letters, had crossed lines between forces, or had been informed on by loyalists or those with a festering grudge. But that wasn’t the only route into the commissions’ jurisdiction. Federal marshals often by late-night or early morning bang -on- the- door, knock- or kick- it open and rush in leveling pistols, muskets or rifles at all in hotel rooms, rooming houses, apartments, town houses, farmhouses added to the detainee numbers. They included mayors and police chiefs, like in Baltimore, and defense attorneys, like in New York who took on cases of others being detained. The third way into the commissions’ control was more “cop on the beat” watchfulness. At border crossings like Niagara Falls and Detroit or in real cities like New York [Manhattan actually, since at the time since the boroughs were not joined together in holy municipal union], local police were detaining [certainly at least until they sorted out who they had and whether the person should be handed over to state or federal courts or military authorities for courts-martial if they were deserters and escaped prisoners of war or commissions if they hijacked ships or tried to burn barges, hotels or theaters]. In the eyes of the detectives and patrolmen or were asked by superiors, all the persons they approached were “suspicious characters,” having acted furtively, spoke with Southern or foreign accents who happened to be in the North. They usually were nabbed in public places like train stations, not on the street. Conveniently for police in these public places, the suspects could be taken into the telegraph office for out-of-public-sight interrogation, just off the waiting rooms. Then, if the suspect didn’t pass muster, they were thrown into a city or county lock-up without charges and almost no chance of going before a civilian judge until much more was known, line-ups held, and on and on. The unnamed American citizen in the Washington Post story has a long road ahead, but at least it is in a “public” federal courtroom. Hey, there was a reporter inside taking notes at least. That almost certainly wouldn’t have been the case during the Civil War with the commissions. They were most often closed-door, over in a wink sessions. Although the Lincoln assassins’ case is the most famous commission proceeding in that war had counsel, lawyers weren’t guaranteed for the thousands of defendants brought before them. Hearsay and coerced testimony was allowed, etc. There was no “judge” per se to rule on matters of law. The odds were skewed in the prosecution’s favor. The use of commissions over civilian courts didn’t end at Appomattox. They continued into Reconstruction in the “military districts” and Tennessee, which had been readmitted to the Union before the acts were passed. Oh yes, to convict a person before the five-member panel, all military officers, only three had to agree. That included capital cases. The Lincoln assassins’ proceeding had a seven-member commission. All death-sentence verdicts went to the president for review. The Army’s judge advocate general, Joseph Holt, a Kentuckian like Lincoln, but a War Democrat and a veteran of James Buchanan’s reshuffled cabinet after the secessionists had the upper hand in the Deep South, sat by his side. If a case got to Lincoln, Holt almost always argued to uphold the verdict. His report to Edwin Stanton, secretary of War and a fellow War Democrat, on the Lincoln assassins, is indicative of his hard-line thinking in these cases. Both were among the hardest of the hard liners until the Radical Republicans gained control of the Congress a short-time later. All other appeals of commission verdicts were tightly channeled inside the immediate chain of command, far out of the sight and certainly the reach of civilian courts. This detainee not only had his day in court, but he wanted legal counsel to free himself at least from the morass he was in now.